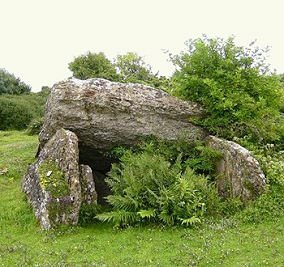 The Pant-y-Saer prehistoric burial chamber, one of many to be seen on the Isle of Anglesey, lies just to the west of the coastal village of Benllech, which is situated on the east coast of Anglesey. The chambered tomb consists of a a kidney-shaped cairn composed of three uprights and a capstone with a horned forecourt. The capstone is extremely large, measuring around 3 metres square and over half a metre thick and it still retains traces of the mound or cairn that once covered the chamber, In its original form this would have measured around 12 metres by 9 metres. The chamber was excavated by Lindsay Scott between 1930-1932 when the remains of 54 men, women and children were discovered as well as flint arrowheads and Neolithic pottery. About 800 metres to the northwest lies the chambered tomb of Glyn. From B5108 (heading in the Llangefni direction) turn right just before the Benllech Rugby Club. Park at a lane heading to the left located several hundred yards down that road. Continue down the lane on foot until arriving at a kissing gate on the left. Go through the gate and keep to the right of the field. At the top of the field is a post with a yellow arrow. Follow the arrow to reach the cairn.